How Can I Back Up WeChat Contacts on iPhone or iPad? WeChat has become ubiquitous. Instead of making phone calls and sending emails.We make appointment with friends and family with this additive instant messaging app. Also, at almost every workplace, WeChat has become the primary means of communication. Conversations through WeChat group messages have replaced email, files can be shared in the app, and group voice calls can replace meetings. We cannot do any of things above without the WeChat contacts which we simply cannot risk losing. Thus it is terribly necessary to back up the WeChat contacts on our iPhone or iPad. As WeChat is a standalone app and there is no way to access the wechat data selectively on the iPhone with any other apps, the only way to back up WeChat Contacts is to export all the wechat contacts items from iPhone selectively to computer. How, you may wonder, can I export the wechat contacts selectively from iPhone or iPad? Actually, it is easy enough to back up WeChat Contacts on iPone or iPad to computer. You just need a third party iPhone data recovery software named iFonebox to access and extract the WeChat contacts selectively from the iDevice. Install and run iFonebox on your computer. Note: iFonebox is available for both Windows and Mac, please choose the right version to download according to what kind of computer you are using. Connect your iPhone to your computer and click “Start” from the startup screen after your iPhone is recognized. Note: If your iPhone is not recognized by iFonebox, please make sure whether you have trusted your computer on your iPhone. Choose WeChat contacts to scan selectively by clicking on the icon of WeChat contacts on the screen where all the supported data categories. After the data scanning and analyzing is completed, all the wechat contacts will be presented for previewing. Select the contacts you want to backup or simply check all to export and transfer all the wechat contacts from iPhone or iPad to computer for backup by hitting “Recover to Computer”. 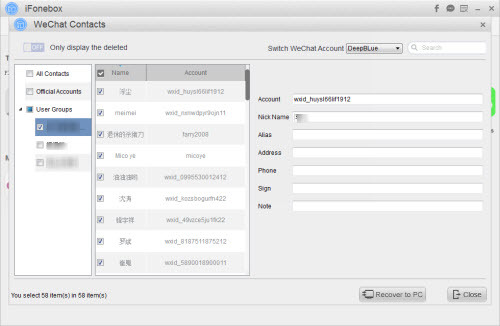 After the recovering process ended, you will be brought to the folder where the wechat contacts are located. With the contacts backed up to computer, you don’t need to worry about losing any wechat contacts accidentally any more. How can I view iPhone photos in WeChat on computer? How To Save WeChat Audio Messages Off iPhone or iPad? This entry was posted in Uncategorized and tagged back up, export wechat contacts from iphone to computer, iPad, iPhone, wechat contacts by IosdroneD. Bookmark the permalink.